*SH913MRA2 is equipped with the function, controingl driving speed automatically　by snow condition. *Push the buttun. 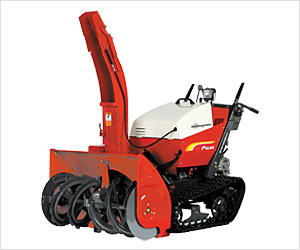 It	control	automatically "Snowmatic"and "Back Auto Lift" . *HST Zero Start : HST lever return to stop position when driving clutch is off to avoid a sudden start. *Independently-movable working part keeps the steering wheel at a constant height, and it makes a operator keep comfortable position. *It adopts boat-shaped crawler that is effective to move backward.